What size air conditioner or furnace do I need for my home? We get this question a lot and it’s an important one. Because if you buy an HVAC system that’s too big, you’ll end up wasting money and energy. And if it’s too small, you won’t get enough cool or warm air flowing through your home. Figuring out an accurate HVAC size involves 2 basic steps. But there are a lot of details to consider in the process. Many utility companies offer a free energy audit that will provide you with your Manual J calculation — just ask. You can also hire an energy auditor or HVAC dealer to do your audit. With a Manual J report in hand, you’ll know exactly how many British Thermal Units (BTUs) of heating and cooling you need for your home. You can also get a rough estimate by looking at the square footage of your house. This chart is a general guideline that covers tiny houses to average size homes. No matter which method you choose, the goal is to estimate the number of BTUs you need to comfortably cool or heat your entire home. Once you’ve got that, it’s time to shop around and make your HVAC pick. Now it’s time to work with an HVAC dealer to learn more about the heating and cooling products they offer. Sometimes the dealer may not have your exact BTU size — but don’t worry. If your BTU requirement is between sizes, simply go with the bigger unit. For example, the Manual J calculation may say you need 25,000 BTUs for cooling. But your HVAC dealer only has air conditioners that handle 24,000 or 30,000 BTUs. Choose the 30,000 BTU unit to make sure your comfort needs are covered. Having a little extra power isn’t bad. This will make sure your system can handle the load on days with extremely high or low temperatures. If you get a unit that’s too small, you may regret it on the hottest and coldest days of the year. Just beware of getting too big of a unit, because it will heat or cool your home too quickly and then shut off. This frequent on and off cycle will cause uneven temperatures and higher energy bills. Rule of Thumb — The maximum size unit you should buy would be 15% over the BTUs you need for cooling and 40% of the BTUs for heating. The max for heat pumps is 25%, since it handles both cooling and heating. Need more advice? 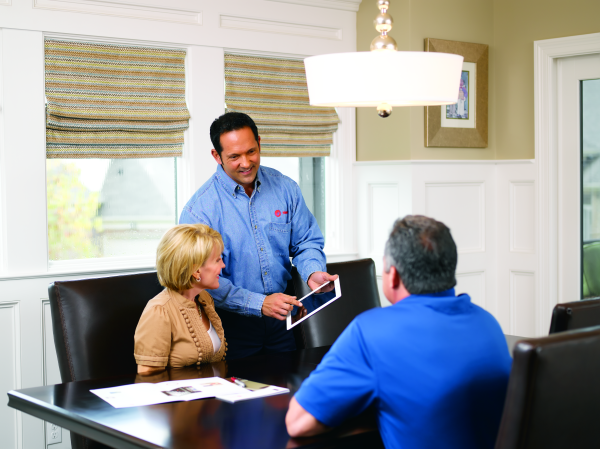 Contact your local Trane Comfort Specialist™ to learn more about your heating and cooling options. You can work together to find an HVAC that’s right for your home.